This collection consists of records related to the Riegle-Neal Interstate Banking and Branching Efficiency Act of 1994. The Act permitted an adequately capitalized and managed bank holding company to acquire existing out-of-State banks. These records also describe the subsequent role of this act during the Clinton Administration. 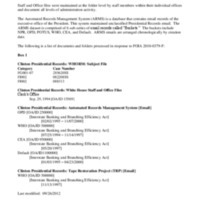 This collection consists of correspondence, memoranda, speeches, press releases, reports, and schedules concerning the passage of the act and its role during the Clinton Administration.